The marketplace for small portable charcoal grills is hotly contested, with a lot of manufacturers producing models, that all seem to offer the same thing. Who do you believe? Which one is right for you? Things can all get very confusing, when you don’t have the details behind the overwhelming multitude of catch-lines and store descriptions, attempting to pull you in. Well, that’s what I’m here for, because I’m a grill buyer just like you, and over the many years I’ve been grilling, I’ve accrued some deal of knowledge on the subject. Yes, I’m the guy at the cookout, who talks for half an hour about how the grill works, while you’re trying to enjoy your food, but in this circumstance, when you’re considering a purchase, I’m actually very useful. So, I’m going to let you in on a few secrets of the Char-Griller 2-2424 Table Top Charcoal Grill and Side Fire Box, so that you’ll have an advantage over all the other buyers. It’s made of heavy steel, so the fact that they’ve kept the weight down to 39 pounds is really impressive and adds to the portability. Because of the heavy steel, the 2-2424 is also extremely easy to transport, without the risk of it getting damaged en-route. The whole unit is an incredibly secure reinforced cylinder shape on short legs, built to look like an old 1950’s log smoker, with the only drawback on portability being the legs, which don’t fold. Although, given that its measurements are 18.5 inches of length, by 16 inches of width, by 17 inches of height; the 2-2424 is already very small, so buyers shouldn’t have a problem with size, even without folding legs. The assembly process of the 2-2424 can hardly even be described as a process, because it comes to you almost full-assembled, with just a few things to do, like tighten up bolts, which always come from the factory, not fully screwed in. After that, it’s a case of washing out the cast-iron and grilling. One thing I want to immediately draw your attention too is that the ‘Duel Usage’ feature of this grill, has some mixed benefits. 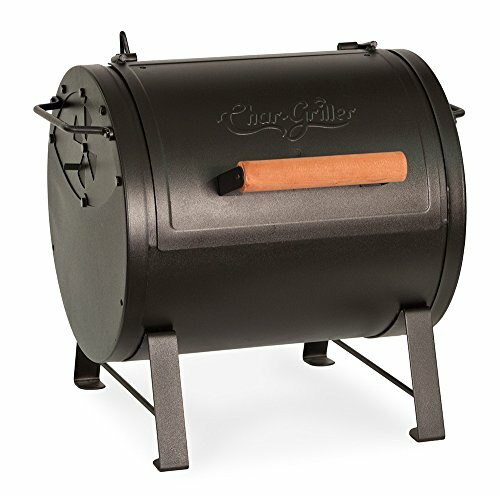 If you have a Char-Griller Pro Deluxe, Wrangler, Outlaw, or Duo; you can connect the 2-2424 up to it, and use it as a Firebox for smoking. The problem comes from the fact that once you’ve done this, you can no longer use the 2-2424 as a grill. So, if for example, you had a Duo, which is not a very portable piece of equipment, and you connected the 2-2424 up to it, you’d now no longer have any portable grill; it’s a smoker forever. So, if you’re wanting to go camping or tailgating any time soon, don’t take Char-Griller up on their duel usage option. I’ll try to help you decide, whether you want to use this as a grill or as a smoker, by explaining what it does in the grilling arena, This is a totally amazing portable grill because it has 250 square inches of cooking space, which is a lot more than what you get on most grills in this price range. And, it’s 250 square inches of quality space, with glorious cast-iron grates, of exceptional thickness, that will ensure, even, moist, flavor-filled steaks and ribs, that taste like a chef just came over to your campsite and started grilling. The heat control is pretty good as well, and many will be surprised by how effective the dampers are because you don’t expect as many adjustment choices on these small portables, as you’d get on a larger, more expensive grill. My only problem with the dampers was that I wished there had been more. To help with the cleaning, the 2-2424 Char-Griller comes complete with a removable ash pan, although you have to give it a good pull before it’ll come out. That said, it does its job well, so you’re not eating ash in the breeze, and the whole thing is porcelain-enamel coated, so debris comes off with one wipe. My advice would be to completely disregard the duel usage function, and just use this as a grill, because you can’t go back once you’ve connected it to another Char-Griller, making it into a smoker, and it’s one exceptional portable charcoal grill. Unless you really like smoked meat of course, in which case I’d say go for it. With 250 square inches of space, cast-iron grates, and some excellent dampers, I think most people will be so overwhelmed by the grilling experience they won’t want to change. The Verdict: Outrageously good value.